These days, the outdoor kitchen and outdoor dining area have become the gathering place for friends who want to simply hang out or where family members share a meal or hold family celebrations. Outdoor kitchens join the landscape and your house in one beautiful flow. 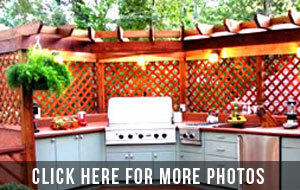 Our Houston outdoor kitchen design can come with a grill, and oven and side burners. Grills can be pre-assembled built-in components or customized to your kitchen design. Wood-fired outdoor pizza ovens are also available. You can have your outdoor kitchen customized as a simple countertop with sink and oven or any combination of kitchen equipment that includes refrigerators, racks, cabinets, and trash bins. The design and feature opportunities for an outdoor kitchen Houston homeowners can appreciate and enjoy are endless. Call or visit us today to schedule a no-obligation consultation.